Please welcome a guest blogger to Two Fat Vegetarians today. Dave Remes is a lecturer at Birmingham City University, a freelance photographer and videographer and a father to three hungry kids! He is fanatical about food flavour combinations and has an idea for a community food programme that will hopefully go into production by the end of this year. Half a small goat’s cheese or more if you like it stronger in flavour! Half of a medium sized butternut squash (I used the top end so didn’t need to deseed) cut into smallish chunks. Halve the head of garlic, retaining the outer skin layers, and lightly rub olive oil on both sides over the cut segments. Place the two halves in the oven skin side down. Place the squash in a roasting tin and place in the oven with the garlic for about 30 minutes (the squash will cook quicker so keep an eye on it). After they have been roasting for 15 minutes, start the risotto. Fry the onion in a knob of butter, with a small dash of olive oil to stop it burning, in a large frying pan until translucent. Add the risotto rice and stir into the onion for about a minute to coat the rice all over. Add the glass of wine and keep stirring to burn off the alcohol., and when this starts to dry up a little turn the heat down fairly low and start ladling a spoonful of stock every few minutes over the rice. The idea is to wait for each ladle full to get soaked up into the rice before adding the next. Make sure that you keep stirring every so often to agitate the starch in the rice. (Before the next stage add a large ladle of stock to give you time in between stirs so the risotto doesn’t dry up). After 30 minutes take the squash out of the oven and pour into a food processor. Take the two halves of the garlic and with a spoon put the sticky, roasted garlic into the processor too. Add about a teaspoon of fresh thyme to the processor, along with half a ladle of stock, or just enough to loosen up the mixture. Blitz until a fairly smooth consistency is achieved and set to one side. The stock should be more or less used up by now – the consistency should look a bit porridge-like, but the rice should still have some bite to it. 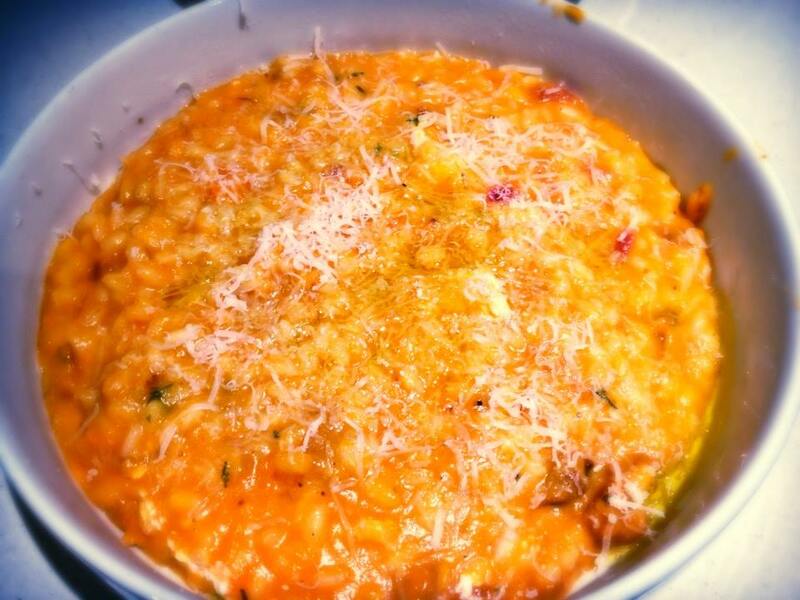 Take the pan off the heat and stir in the butternut squash mixture until the risotto looks a deep orange colour and crumble in the goat’s cheese until mixed throroughly. Add a handful of grated parmesan cheese and maybe a splash of olive oil to serve.